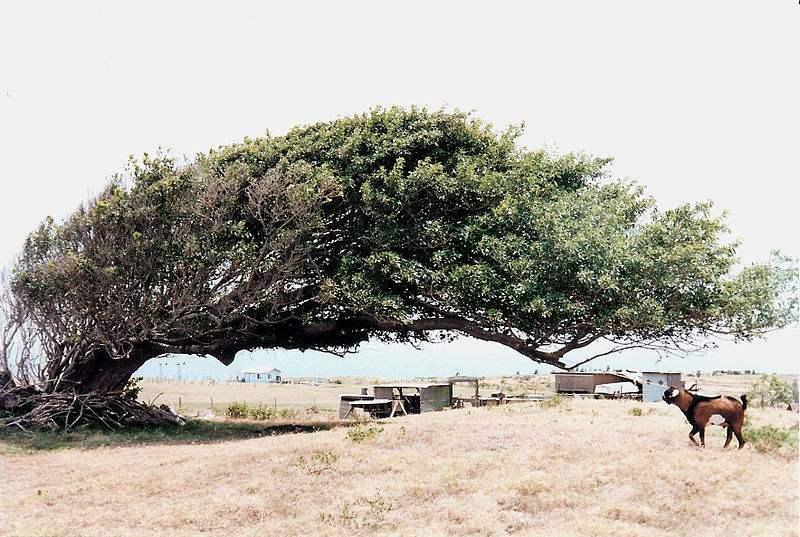 A wind-blown tree at Ka Le, the southern-most point of the Big Island which is almost constantly subject to high winds. We have been having very intense winds here the last few days. 20-30 mph, with gusts up to 50 mph. Since we’re in a desert with few trees and little else to get in the way of the wind, it moves undispersed in huge waves across the lava rocks. You can hear it roaring from far away, getting gradually louder and louder, until you can see it start to hit the first few trees, coursing through their branches, until it finally washes over you. Usually we aren’t aware that air is a material thing, just like any other substance. Hence why we say things like, “it came out of thin air” when we mean something comes from nowhere, out of nothing. But intense wind reminds you that the stuff you are walking through and breathing at all times has physical power. Ikkyu constantly privileges images of transiency: dust and wind are two common themes. Rather than trying to find a clear, linear direction in life, or to plan out a future for ourselves, we would do much better to abandon ourselves to the whims of the wind, and let life carry us on its own. As I’ve said before about detachment, this doesn’t simply mean abandoning yourself to the mechanics of the world, which would lead to destruction. It means letting your actions and reactions come as freely and spontaneously as a gust of wind. I find this is very useful for focusing when I meditate. Usually I will just follow my breath and concentrate on inhaling and exhaling, but sometimes I get too focused on it, and I lose sight of what I’m doing. I get too into the rhythm of “in-out,” and I forget to let my mind be free. When this happens I usually just look out the window at a branch or leaf, and focus on the way it moves in the wind. Even when it seems like there is almost no wind you can still find movement: the air is still there, moving, even if almost imperceptibly. By doing this, I free my mind, I allow it to unfocus. My thoughts are blown around in the wind, and I don’t worry about what comes in to my mind and what goes. I simply watch it as it moves. Because just like the wind and the air, your mind is something. It never becomes totally blank, or empty, it is always moving. The point of meditation is to allow yourself to be carried along comfortably by the winds of your mind instead of feeling like you are being tossed around and out of control.